The development of turntables and record players has changed throughout history. New innovations and designs allow improvements that carry forward and improve the sound quality. While modern designs look vastly different from the original photograph, you can see a reflection of the initial invention when you evaluate the history and development of the phonograph. The original phonograph was invented and patented by Edouard-Leon Scott in 1857. He called his device the phonautograph and he patented the invention on March 25 of 1857. The initial invention made a recording of sound waves on a glass plate, but it was not able to play back the sounds. The purpose of Edouard-Leon Scott’s invention was to evaluate acoustics rather than to play back sounds and music. After the initial development, it was changed to record sounds on a lamp-blackened paper using a drum or cylinder to hold the paper in place. It was the original phonautograph that inspired later inventions and encourages the development of the phonograph. In 1877, Thomas Edison invented the phonograph using a combination of the phonautograph, the telegraph and the telephone. His goal was to transcribe messages from the telegraph to a piece of paper tape. The transcribed messages would then be in a format that allowed the individual to send out the same message repeatedly via a telegraph. 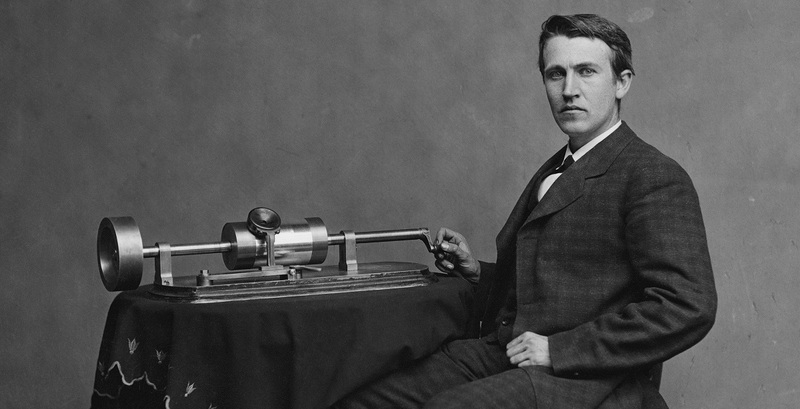 After Edison realized that his device may have other applications in relation to the telephone, he worked to develop a strategy to record sounds. He developed a device that would use one needle to record the sounds onto a cylinder with tin foil. A second needle was used to replay the sounds via the phonograph. After working with John Kruesi to build the device, he recorded the nursery rhyme “Mary Had a Little Lamb” and then played the rhyme over the invention. Edison filed a patent for the phonograph on December 24, 1877 and the patent was issued on February 19, 1878. The goal of the phonograph was to record sounds and then replay the sounds. Thomas Edison succeeded with his device, but lost interest in the development of the device when the public lost interest in the initial invention. He stepped away from the invention and making improvements to the sound for a few years. In 1880, Alexander Graham Bell invented the telephone and he used the money he earned from his invention to work on new inventions and developments. He took Edison’s original phonograph and started making adjustments and changes to improve the device. A key problem with the original phonograph was the use of tin plates for the recording. The tin wore out quickly from the rigid needle, which resulted in complications when using the tool. Alexander Graham Bell used a floating stylus to play back the sounds and music. He also started using wax instead of tin foil for the recordings, which made them more durable and long-lasting. He called the new device the graphophone. Although the adjustments improved on the original design, Thomas Edison decided to make changes to his original invention personally. His changes focused on perfecting his invention. He then started his own company to sell the new and improved phonograph. After the initial development of the phonograph, changes and improvements began developing at a rapid pace. By 1901, mass produced wax cylinders allowed artists to record a song or other sounds in larger quantities rather than recording each cylinder one at a time. That resulted in more opportunities for the music industry and changed the way that people enjoyed music. The device changed and altered over several years to keep up with the consumer demand. By 1913, the device started using discs rather than cylinders to play back sounds. Over time, the phonograph developed into the record players used in modern music. The history of the phonograph sets the foundation for music and the music industry within the United States and the world. It set the stage for a new era of technological advances that allowed people to record messages, music and other information. While the phonograph has changed significantly over the years, it was an important invention for technological advancement.